Olympic legend and gold medalist Jackie Joyner-Kersee will speak at 3 p.m. Wednesday, May 25 during a ribbon cutting ceremony in East St. Louis for the new Southern Illinois University Edwardsville Head Start/Early Head Start Program’s new wing located at the Foundation Center which bears her name. Joyner-Kersee, along with Head Start program staff, governing body members and community officials, will celebrate the new $2.4 million, 22,000 square foot addition to the JJK Center. Of the new wing that was completed in March, 9,000 square feet are dedicated to SIUE Head Start/Early Head Start Program, according to Marcia Oliver, SIUE JJK Head Start/Early Head Start Center coordinator. The new will house eight classrooms, outdoor playgrounds and family engagement and support services offices. The new addition is primarily a result of an anonymous donor’s desire to see Joyner-Kersee’s dream of investing in the children and people of East St. Louis continue to grow and flourish, added Pamela Coaxum, JJK Foundation executive director. SIUE and JJK began talks of collaboration in 2015 when a donor came to light and plans to build the new addition was commissioned, according to Mike Greenfield, director of programs and facilities at JJK. “We decided to find a partner because we are not experts in early childhood education. Once we began talking to SIUE, the ‘marriage’ happened somewhat quickly,” Greenfield said. “We signed a contract in August 2015 and Head Start children moved into a space we prepared for them in September 2015. For more information, contact the JJK Foundation at (618) 274-5437 or events@jjkfoundation.org. The SIUE Head Start/Early Head Start Program is a nationally recognized quality early childhood education program that promotes school readiness for children and self-sufficiency for families. Services are available to St. Clair County expectant parents and families of children ages six weeks to five years old. The SIUE Head Start/Early Head Start Program provides services to 1,314 children and families and the Early Head Start Program serves 188 children and families. Both programs include children with specialized needs and English as Second Language Learners (ESL). The SIUE Head Start /Early Head Start Program is the winner of six National Head Start Association Awards. Its mission is to provide quality individualized comprehensive services that empower children, families, and staff from diverse backgrounds in order to achieve success. The Jackie-Joyner Kersee Foundation – Jackie Joyner-Kersee is committed to ensuring that all children have access to high quality after-school programs, safe recreational places within their communities, and caring adults to help them achieve their dreams. Jackie launched the Jackie Joyner-Kersee Foundation in Los Angeles and moved it to East St. Louis in 1995. Inspired by the closing of her neighborhood community center, Jackie grew the Foundation by raising over $12 million to expand programming and built a comprehensive youth and sports facility and campus that opened in 2000. 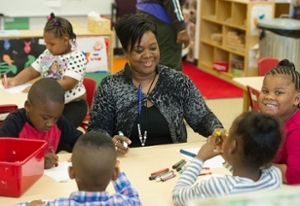 Annettee Smith-Rockett, JJK Head Start Center teacher assistant, works with some of the children in her class. 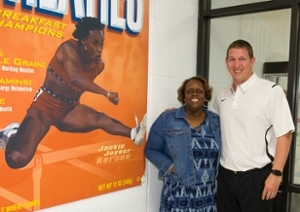 L-R: Pictured are Marcia Oliver, Jackie Joyner-Kersee Head Start Center coordinator; and Mike Greenfield, director of programs and facilities at Jackie Joyner-Kersee Foundation. 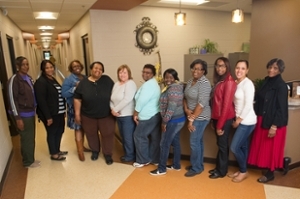 Shown are Marica Oliver, Jackie Joyner-Kersee Head Start Center coordinator, and part of her staff.